The FBI is searching for these two men. 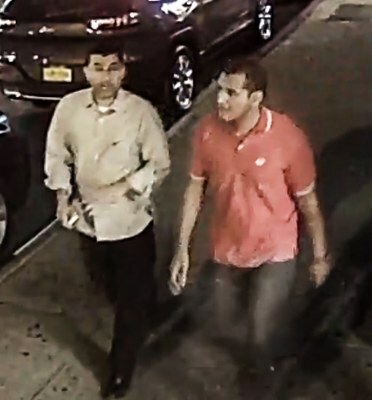 The FBI is searching for two men who were spotted removing an improvised explosive device from luggage on a sidewalk in New York City over the weekend. Surveillance video shows the men taking the luggage but leaving the bomb behind. The device was near another bomb that detonated on West 23rd Street in Manhattan on Saturday night, injuring more than 25 people. The men were captured on surveillance between 8 p.m. and 9 p.m., the same period when the other bomb exploded. Police arrested Ahmad Khan Rahami, 28, in connection with the bomb that had detonated. It’s unclear whether the other men in the video are connected to Rahami. Posted: 9/22/16 at 10:58 AM under News Story.